Discovered in 1506, Tristan was visited by whalers and ships sailing around Africa to the East, but not permanently settled until the 1810s. 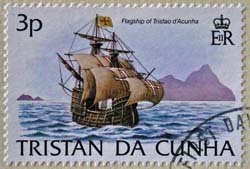 The Tristan da Cunha Islands were discovered and the main island named by the Portuguese admiral Admiral Tristao da Cunha en route to the Cape of Good Hope in 1506. The Quincentenary of this event was celebrated by a series of events in 2006. 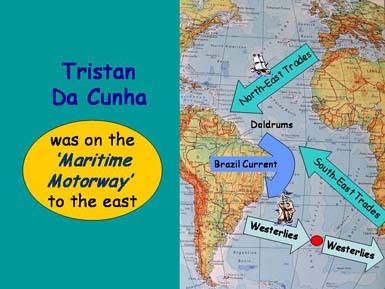 Tristan started to appear on nautical maps from 1509 and also on Mercator’s 1541 World Map. The first recorded landing was by the crew of the Dutch vessel Heemstede in 1643 who replenished their supplies with fresh water, fish, seals and penguins. The Dutch mounted two expeditions to Tristan between 1650 and 1669 to explore whether the island could become a supply base for ships, but this idea was abandoned, probably due to the absence of a safe harbour. In the late 18 th Century an increasing number of American whaling and sealing ships frequented the Tristan area, and Captain John Patten of Philadelphia used the island as a base during the 1790/1 summer, living in tents and collecting seal oil and 5600 sealskins. 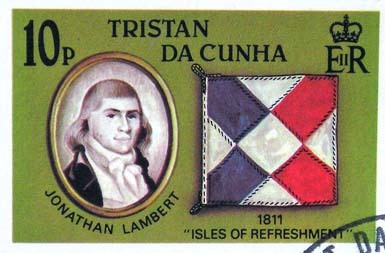 The first attempt to settle on Tristan da Cunha was made by Jonathon Lambert, from Salem , Massachusetts , who led a party of three men in 1810 to establish a trading station on Tristan which he re-named ‘Reception’ on what he wished to be known as the ‘Islands of Refreshment’. Tomasso Corri (alias Thomas Curry from Livorno in Italy) was the only survivor of this fledgling community when HMS Seiramis arrived in 1813, and he reported that Lambert, with two companions, had drowned in a fishing accident. Legends of Thomas’ treasure are still current in the Tristan community and are explored in several books. 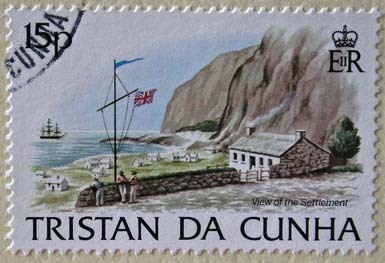 It was the British military, however, who secured the political future of Tristan da Cunha, when, on 14th August 1816 a garrison aboard HMS Falmouth took possession of the island on behalf of King George III. The base, known as Fort Malcolm, was established to secure the island when there were concerns that the French may use the island as Napoleon was imprisoned on St Helena after his defeat in the Battle of Waterloo in 1815, and also to prevent American ships from using Tristan as a base, as they had during the 1812-14 Anglo-American War. The Admiralty soon dismissed Tristan’s strategic importance, especially after the wreck of HMS Julia off the Fort in May 1817 with the loss of 55 men, and the garrison was withdrawn aboard HMS Euridice in November 1817. 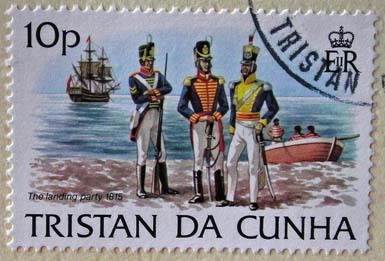 Stamps showing left, the British landing party in August 1816 (note wrong date on stamp) and right Somerset Camp and Fort Malcolm.